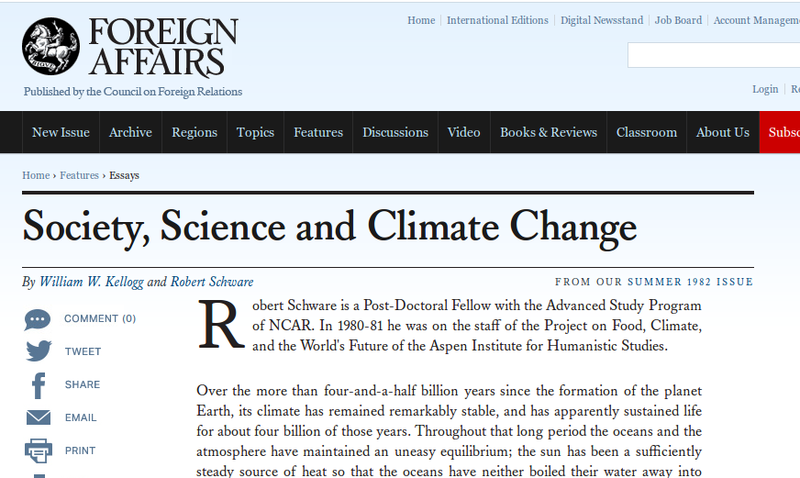 On Jan 1st 1981 a book called “Climate Change and Society” was published, authored by a natural scientist (William Kellogg) and a sociologist (Robert Schware). Context: A year after the first World Climate Conference in Geneva, and after the Charney Report concluded that there was no reason to doubt that increased carbon dioxide in the atmosphere would spell trouble, Reagan had beaten Carter to the White House. The Cold War was going to heat up again. Climate change was barely a glimmer in the eye of the public. “If the consensus of international climatological community is correct and if world fossil fuel use continues to increase atmospheric carbon dioxide, mankind will likely cause a significant average warming of the Earth’s surface within the next 50 years. In 1987 Kellogg published an excellent summary of the means by which global warming came to be understood. See “Mankind’s Impact on Climate: The Evolution of an Awareness” in Climatic Change April 1987, Volume 10, Issue 2, pp 113-136. What does all this mean? That before climate change could become an overnight sensation in June 1988, there were many, many attempts to get it onto the agenda. A small number of those will be honoured on this blog. Kellogg, W. and Schware, S. (1981). Climate Change and Society: Consequences of Increasing Atmospheric Carbon Dioxide. Colorado: Westview Press. See also: John Urry’s rather good 2011 effort of the same name, published by Polity. 2003 Greenhouse Gas Reduction Scheme (GGAS) launched in New South Wales, the world’s first mandatory emissions trading scheme.